Our momma cows are at the heart of our operation. We started our Wagyu adventure from the basis of a commercial cattle farm and our dams reflect that beginning. Many have been with us for a number of years and are old hands when it comes to moving about our pastures and working areas. As we continue to produce F1 (50%), F2 (75%), etc. 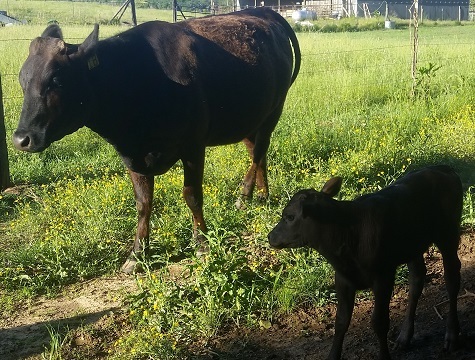 Wagyu cross heifers, we are keeping the best examples as replacement cows so that we can eventually increase the native percentage of Wagyu influence in our herd. In 2014, we took the plunge into fullblood Wagyu cattle with the purchase of 3 cows from the Lone Mountain Wagyu operation in New Mexico. We have also been in the market for high quality full blooded Wagyu embryos to 'grow our own' breeding stock. In 2015, we also took the step of replacing our Hereford backup bull with a full blood Wagyu bull. This means that every calf produced on the farm will have Wagyu influence. The end goal is a blended operations that offers a range of options from F1 to fullblood Wagyu beef. A number of our Dams now show up in the registration books of the American Wagyu Association (AWA). The AWA website has a lot of great information on Wagyu cattle and you can browse the herd book as well. If you search the herd book for cattle whose names start with WF%, you will see a number of our dams. Those with an ID number starting with a B are our cows with no Wagyu influence, but that have Wagyu cross offspring. Cows starting with RE are slightly less than 50% Wagyu since we made the mistake of using a bull the first year that was only 99%. Our PC cows are full F1 (50%), F2 (75%), or F3 (87.5%) Wagyu cross cattle. PB cows (when applicable) are F4 (93.75%) or greater and are called Purebred. 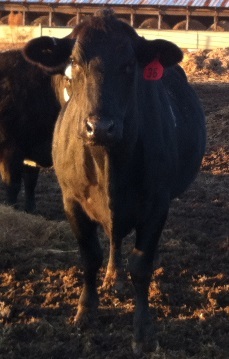 Our FB cattle are 100% Wagyu and are called Fullblood. Our daughters are responsible for providing the names for registration. They tend to pick themes; for instance the naming theme for the 2013 crop of heifers was 'Disney Princesses'. Next up was a tour through the Greek goddesses. Recently, we've been registering heifers named after flowers. In order to offer a more steady supply of beef to our customers, we have implemented a program of three breeding seasons during the year. March calves come from cows bred on June 1, July calves are from October 1 breeding, and November calves are bred February 1. We breed each of the three groups via AI to very good Wagyu breed sires, or implant a fullblood embryo if the cow is a better as a recip. Now that we are only using Wagyu bulls as backups to our AI/ET program, cows calving outside of the main group still have WagyuX offspring. When you factor in the calves coming from the backup breedings, we pretty much have calves hitting the ground all year long! As we have a large number of cows, and there is regular turnover in our stock, we will concentrate on providing information on those that are related to our Available Supply or our registered AWA entries. Decided to implement a new ordering system staring with 2016 calves to show the cow that produced the most recent calf on top of the list. It's hard to keep up during calving season, but I'm trying! 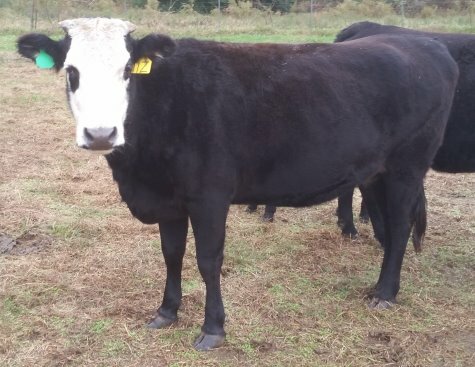 Notes: This unique looking cow came with a set of 9 bred Brahaman influenced sisters I bought in 2015 to expand the herd and introduce a new genetic influence to try. These hand-raised, puppy dog friendly girls had the same gray Brahman bull sire even though they each have their own distinct look. They were bred to a low birthweight Angus bull for easy calving and delivered exactly as promised. In 2017, she gave us her first Wagyu cross calf and he looks to be a good one. I hope these girls contribute to our program for many years. Notes: This beauty of a cow came with a set of 9 bred Brahaman influenced sisters I bought in 2015 to expand the herd and introduce a new genetic influence to try. These hand-raised, puppy dog friendly girls had the same gray Brahman bull sire even though they each have their own distinct look. They were bred to a low birthweight Angus bull for easy calving and delivered exactly as promised. 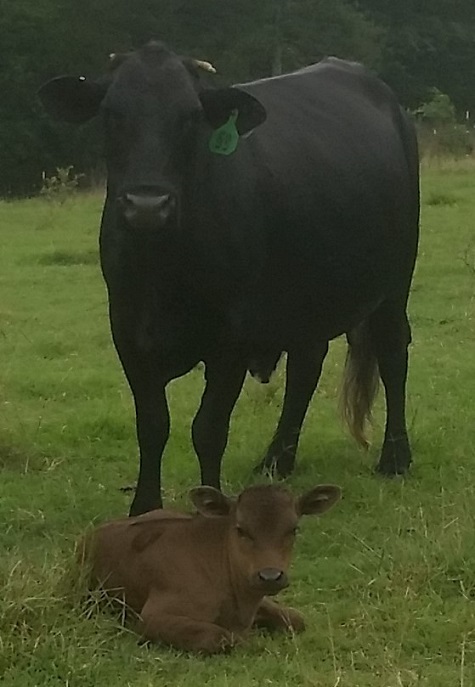 2017 brought her first Wagyu cross calf; a fine steer calf by one of our FB Wagyu pasture bulls. I hope these girls contribute to our program for many years. Notes: This cow joined us in 2016 with a set of 14 bred heifers, each sporting at least 25% Holstein genetics. This one has a lot of the Holstein coloring and quite a lot of milk. We are very excited about this group and we expect them to do a great job in the future raising our fullblood calves from embryos. She missed the embryo transplant attempt and delivered a nice looking steer to our 8B bull. Notes: This Disney Princess series cow was one we kept from our third group of Wagyu cross calves. We bred her early and she delivered her first calf as one of the last of the year in December of 2014. She got a little extra recovery time, but missed her AI breeding and her 2016 calf wass from our 8B Wagyu bull. For 2017, she also missed her AI breeding but this time delivered a good looking heifer calf that has graded out in the top of her class to our Wagyu bull Noche. Notes: This good looking heifer was one of a group of commercial calves we retained from our backup Hereford bull on his way out. She looks to have great maternal traits and none of the nerves from her mother. It looks like she's going to pass on some nice markings to her calves as you can see in first calf, a little WagyuX heifer from our young 8B bull. 2017 also yielded a black mott faced calf from an 8B mating; this time a steer. Notes: This cow came in during the 2014 upgrade expansion but it took a while to get a WagyuX calf from her. It turns out she is one of those very protective mothers and heads for the woods as soon as she sees us coming. We never got a picture of her 2016 calf, but her 2017 effort by our Fullblood bull Noche is a good looking heifer. Notes: This pretty heifer was the 'backup' offspring of one of our favorite cows in 2014. She should make a wonderful cow in her own right and she is is off to a good start with a healthy WagyuX bull calf in 2016 right on schedule. For 2017, she missed her embryo transfer breeding but delivered a pretty little heifer from our 8B bull. Notes: This cow joined us in 2016 with a set of 14 bred heifers, each sporting at least 25% Holstein genetics. All were bred to a low-birth weight Hereford bull so they should produce some interesting calves. This one doesn't carry much of the Holstein look, but she sure has great milk. We are very excited about this group and we expect them to do a great job in the future raising our fullblood calves from embryos. She missed taking the first embryo transplant we tried but delivered a nice looking steer to our 8B bull. Notes: This young cow joined the program in 2014 but had a rough go with her first delivery in the harsh cold and snow of Feb 2015 where she lost her calf. She got an embryo for her second try and delivered the first Fullblood Wagyu bull of the year in 2016. We hoped she would bring us another embryo calf in 2017, but instead she gave us an F1 Wagyu steer from our big backup bull, Noche. Notes: This beauty of a cow came with a set of 9 bred Brahaman influenced sisters I bought in 2015 to expand the herd and introduce a new genetic influence. These hand-raised, puppy dog friendly girls had the same gray Brahman bull sire even though they each have their own distinct look. 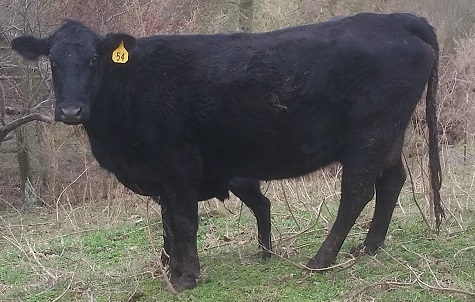 The Angus cross calf came with was retained for breeding stock, and she bred back quickly to produce an early F1 steer from our herd bull that roamed our "first calf heifer" pasture in those days. These F1 progeny show a lot of promise in size and growth and I hope she and her sisters contribute to our program for many years. Notes: This heifer was born on our farm in the fourth crop of WagyuX calves in 2016. She is the first calf of one of our early retained heifers but made the cut for retention. As an F2, her offspring will be 7/8 Wagyu and only a step away from being classified as a Purebred! She is a little small, so we were a little worried about her calving but she delivered a little F3 heifer with no issues whatsoever! Unfortunately, that calf did not survive until time to be weaned. 2017 brought another F3 calf; this one a steer. Notes: This cow came with a set of heifers that all sported a little "milkstock" by way of some Holstein influence in their lineage. While she doesn't show it in coloration, she does have very good milk. 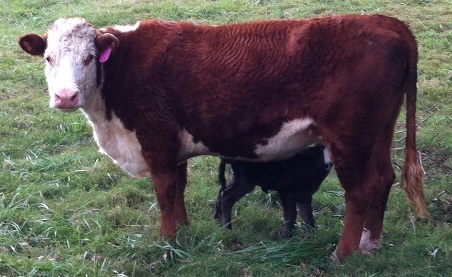 Her first calf (that she arrived bred with) was retained for breeding stock. 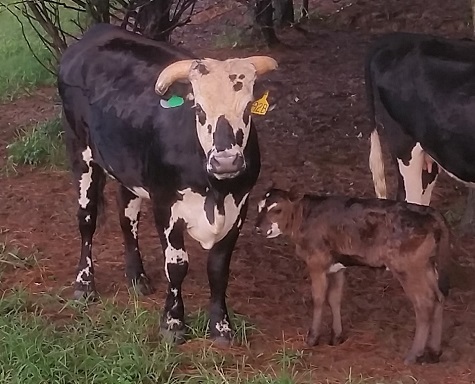 For 2017 we gave this cow a try with a Fullblood Wagyu embryo and she delivered a nice looking bull calf out of a promising black/red Wagyu crossing. Notes: This beauty of a cow came with a set of 9 bred Brahaman influenced sisters I bought in 2015 to expand the herd and introduce a new genetic influence to try. These hand-raised, puppy dog friendly girls had the same gray Brahman bull sire even though they each have their own distinct look. They were bred to a low birthweight Angus bull for easy calving and delivered exactly as promised. For 2017 we gave this cow a try with a Fullblood Wagyu embryo and she delivered a beauty of a heifer calf right on time and is caring for it with that famous Brahaman ferocity. Notes: This heifer is one we retained from 2015, and is one of the Greek goddess series. Tethys was goddess and font of fresh water that nourished the earth. This heifer was one of our F1s with a perfect score on her SCD/Tenderness test of AA/10. Her first calf was a steer by a red Wagyu bull. Notes: This dam joined our farm in late 2010 as a bred heifer. For a while, her calves, no matter the bull, were always been white in color but recently she has broken that tradition. She delivered a Wagyu cross bull calf in 2012 and a pure white Wagyu F1 cross heifer calf in 2013. 2014 was a sad year for this cow as she delivered a beautiful little mott faced F1 heifer that was stillborn. 2015 got her back on track with another mott faced WagyuX calf. For 2016, we went a different route and implanted a fullblood embryo and she delivered! She did a great job raising that little Fullblood heifer so we tried again for 2017 and she produced another little Fullblood calf right on schedule. As one of our favorites, we have high hopes that she will be a great part of our farm for many years. Because of her status as a base cow in our herd, she has an entry in the AWA Herd book. Notes: This fuzzy cow made her entry in the program a couple years ago, and we did retain her 2014 calf for breeding stock. 2016 brough us her first WagyuX calf and we followed up with an embryo with some exciting genetics for 2017. She's a friendly, good natured cow that has a lot of curiosity and is usually one of the first to come when called. Notes: This young cow came in during one of our upgrade expansions and it took a couple of years but she finally gave us a F1 bull calf in 2016. Rocking on along for 2017, she delivered a FB calf from an embryo for her second effort. Notes: This heifer is one we retained from 2014, and is one of the Greek goddess series - actually a Greek Titaness. Themis was the Lady of good counsel and is the personification of divine order, fairness, and law. She is doing a great job with her first calf; by one of our stock of red bulls. Notes: This beauty of a cow came with a set of 9 bred Brahaman influenced sisters I bought in 2015 to expand the herd and introduce a new genetic influence to try. These hand-raised, puppy dog friendly girls had the same gray Brahman bull sire even though they each have their own distinct look. 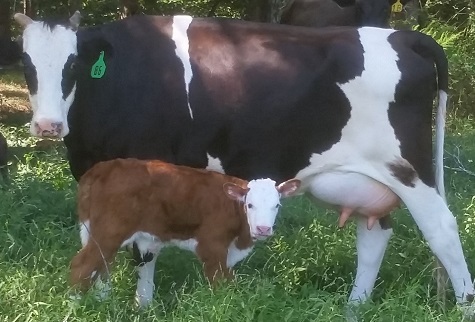 After her first commercial calf, she was bred with a Fullblood embryo that she delivered right on schedule. I love this type of cow as a mamma - just notice that look in her eye and think if you want to get any closer to her calf! No coyote has a chance around her. I hope these girls contribute to our program for many years. Notes: This good looking cow came with a set of 9 bred Brahaman influenced sisters I bought in 2015 to expand the herd and introduce a new genetic influence to try. These hand-raised, puppy dog friendly girls had the same gray Brahman bull sire even though they each have their own distinct look. 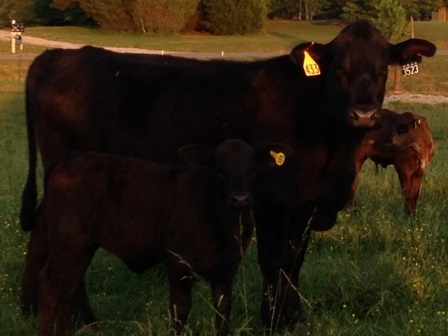 Their first calves were Angus cross and made good replacement stock, but hers died of blackleg the day we vaccinated. 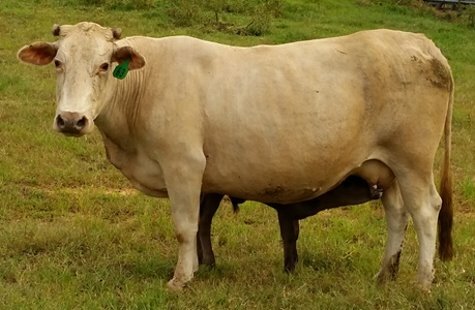 She received an embryo for her second calf and delivered right on time. I hope these girls contribute to our program for many years. Notes: This heifer is one we retained from 2015, and is one of the Greek goddess series. Artemis was goddess of chastity, the hunt, the moon, and the natural environment. 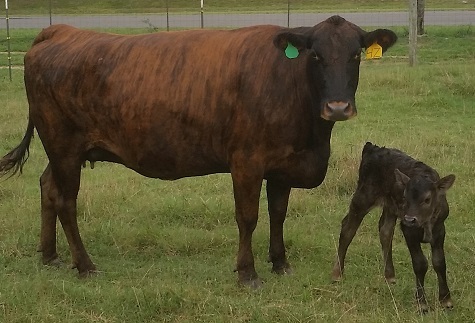 We love this girl's coloration and are happy to see that she passed it on to her first calf by a red Wagyu bull. Notes: This great looking heifer was one of the first of the 2015 retained heifers to produce a calf. Her calf had issues with its front feet and we had to stretch out the tendons with splints for a few days to get him going right. Notes: This heifer was born on our farm in the second crop of WagyuX calves in 2012. 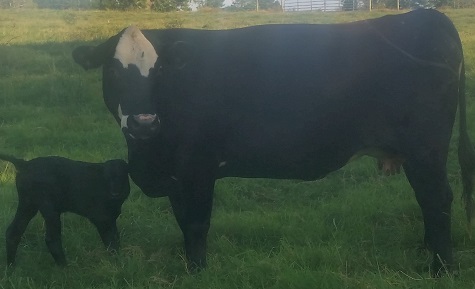 Her name comes from the fact that she was born about 20 days before her due date which wasn't too surprising since her dam always delivers the first calf of the year. We bred her in 2013 at 13 months of age, two months before the mature dams in this group to give her a little extra recovery time with her first calf. Much like her mother, she delivered a little bull calf about 10 days early. She was bred back in May and delivered her second calf right on time with her breeding group. 2016 proved her to be a model of consistency as she delivered a little F2 bull calf right on time. For 2017, she delivered right on time again - this time to a new red bull we are giving a try - and once again, about 10 days ahead of schedule. Notes: This heifer was born on our farm in the first crop of WagyuX calves in 2011. Technically, she is 49.8% Wagyu due to her Pure Bred sire (hence her RE registration number). She gave us our first F2 WagyuX in 2013, but it sure turned out pretty small. Learning from that experience, from now on, our first calf WagyuX heifers will spend some time on feed after calving to help bring in their milk and keep them in good body condition. She missed her AI breeding and produced a 25% Wagyu influenced heifer with our backup bull in 2014 and again in late 2015. With nothing but Fullblood bulls in our pasture, 2017 brought a return to F2 production with a little steer. Notes: This beauty of a cow came with a set of 9 bred Brahaman influenced sisters I bought in 2015 to expand the herd and introduce a new genetic influence to try. These hand-raised, puppy dog friendly girls had the same gray Brahman bull sire even though they each have their own distinct look. 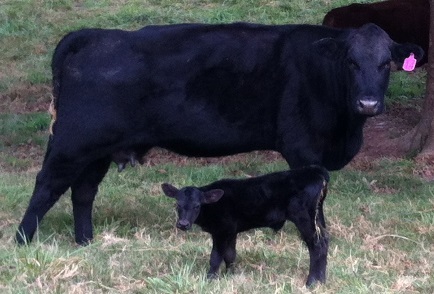 Her first calf was an Angus cross that we are keeping for breeding stock. She bred back to our Fullblood bull before we could plan a mating so we got a nice little F1 heifer. I hope these girls contribute to our program for many years. 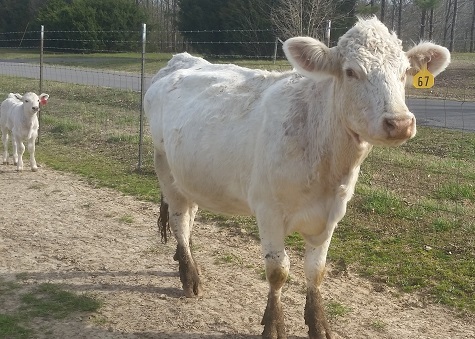 Notes: This cow got off to a rough start but she is now back on track. We bred her early for her group but she lost her first calf in December of 2014. Her 2016 calf was a bull from our Fullblood Wagyu backup that graded out very good. We have high hopes for this 2017 calf to do the same. Notes: This cow is a daughter of one of our favorite dams. 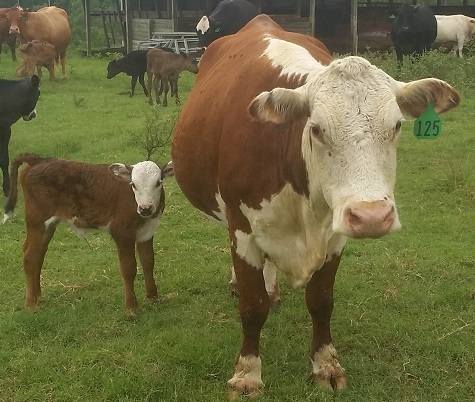 We bred her early and she delivered her first calf in December of 2014 and we are very happy with the job she did. Before her turn for AI came back around, our backup Fullblood bull in the heifer pasture bred her, which put her ahead of schedule for 2016 and is pretty impressive for a first calf heifer. For 2017, we bred her via AI to a good red bull, but we will have to DNA test for the sire and see if it was him or the Fullblood pasture bull that is this ones dad. Notes: This cross-bred cow is a lesson in second chances and happy accidents. She was on her way out of the program after missed breedings and disappointing results, but got a second chance after we drug our feet on getting her to a cow sale. While waiting for a ride off the farm, she happened to spend time in a temporary pasture with on of our young prospect herd bulls ... some magic happenend and when we checked her again she was bred with the calf she delivered in 2016. 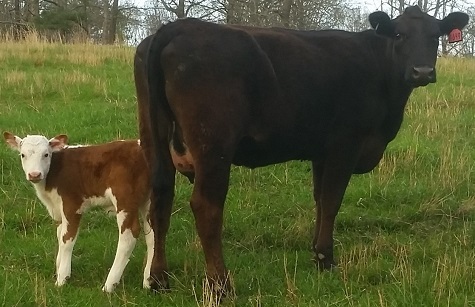 For 2017 since she was nursing a WagyuX calf, we tried her with an embryo and she gave us a calf from a new genetic pairing that traces back to original imported genetics. Notes: This good looking heifer was retained from our 2015 crop as a replacement cow. When it was time for her first AI breeding, we found she was already bred by a not-quite steer in our grower pasture. 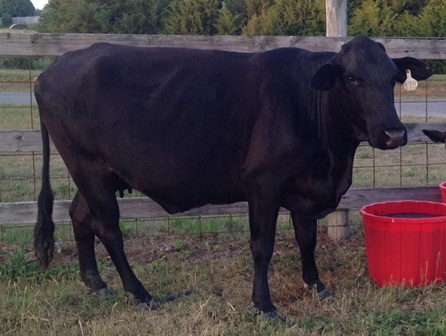 Notes: This cow joined the program a couple years back but never would catch her AI breeding. With our new Fullblood backup bulls in place in 2015, we finally got a Wagyu cross calf out of her in 2016. For 2017, we tried her with a Fullblood embryo and were rewarded with the first calf of a home-grown pairing that we put together. Can't wait to see how this calf grows and measures out. 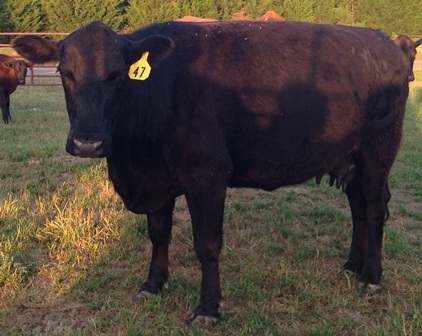 Notes: We retained this Disney-theme named heifer for breeding purposes from the 2013 crop. She took a couple of tries to get bred, but delivered a nice bull calf in the summer of 2015. She was slow to breed back and missed her AI attempt but delivered an early 2017 calf by our Fullblood backup bull. 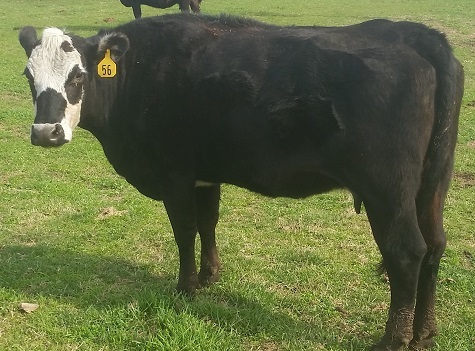 Notes: This cow raised a couple of commercial steers before taking an embryo in her 2016 breeding. The resulting calf is from a Fullblood pairing that we are very excited about. 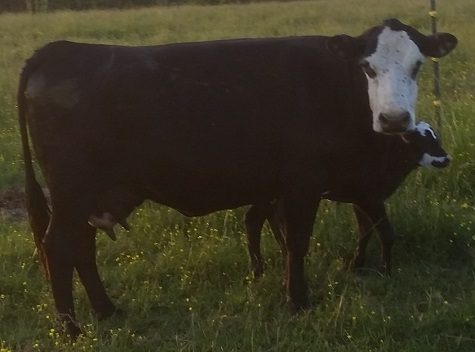 Notes: This cow has been on the farm a long time but has never taken her WagyuX breeding until the calf she delivered in 2017 from our Fullblood backup pasture bulls. Notes: This beauty of a cow came with a set of 9 bred Brahaman influenced sisters I bought in 2015 to expand the herd and introduce a new genetic influence to try. These hand-raised, puppy dog friendly girls had the same gray Brahman bull sire even though they each have their own distinct look. They were bred to a low birthweight Angus bull for easy calving and delivered exactly as promised. This one bred back quickly and delivered her second calf, this one a WagyuX, less than a year after the first one! And to top it off, she has the honor of delivering the first calf of 2017. Notes: I bought this cow as a bred heifer in 2012 and she somehow managed to hang around without delivering a WagyuX calf until now. I like the cow but her consistency needs to pick up for her to stick around. In this case, she delivered the final Wagyu influenced calf of 2016. Notes: This heifer is not named after the shoe company - she is one of the Greek goddess series; Nike, the Greek goddess of Victory! She missed her AI breeding but delivered an F3 calf from our Fullblood herd bull soon after. Notes: This young heifer is one our first F2 progeny that was saved for breeding stock. (Technically, she is not quite an F2 at 74.9% Wagyu, but that's close enough for me!) She took a while to settle in and missed her first two breeding attempts before having a calf through natural service with one of our Fullblood Wagyu bulls. Her first calf, born in January of 2016 was our first of the year and only our second F3 calf ever born - but the fun didn't stop there! She re-bred very quickly and delivered a SECOND calf in 2016! If she could have held out a few more weeks, she might have had the LAST calf of the year, which would be quite an accomplishment! If that wasn't enough, she also managed to have a calf by each of the first two (brother) Fullblood bulls we raised, 8B and 10B. Notes: This heifer is the offspring of one of our long-time stalwart cows and our backup bull. She was retained as a replacement cow with our set of F1 Wagyu heifers. She was bred at 15 months and was the last of the three gals that calved in our hastly created 'maternity ward' in our hay barn during a very cold spell of 2015. She struggled to breed back, but finally delivered her 2016 effort late in the year. Notes: This heifer is one we retained from the 2013 crop as part of the Disney series heifers. She didn't come into heat on her first attempt at AI breeding but caught the second time and delivered a nice heifer calf in the fall of 2015. Notes: We retained this heifer for breeding purposes in the Disney series time frame from the 2013 crop. She is the daughter of one of our favorite cows and has a unique mostly white coat with a white face. She missed her first attempt at AI breding but caught the second time and delivered a nice bull calf in the summer of 2015. We keep hoping one of our white F1 Wagyu calves will have a white F2 but this one was black so no luck so far. 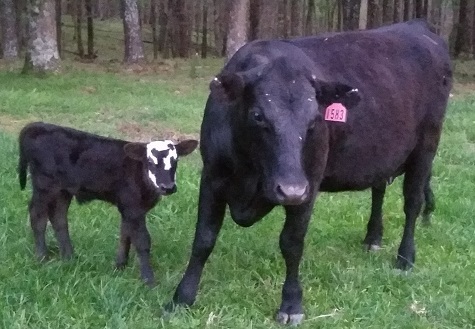 2016 brought another black calf, this time from our Fullblood backup bull. Notes: This heifer was born on our farm in the first crop of WagyuX calves in 2011. Technically, she is 49.8% Wagyu due to her Purebred sire (hence her RE registration number). It took her some time to take the breeding but she finally gave us an F2 Wagyu heifer calf in August of 2013 that was worth the wait. 2014 brought a second heifer calf that also graded out well and will be retained for breeding stock. In 2015, she missed her AI breeding and deliverd a 25% Wagyu calf with our Hereford backup bull that we also decided to keep. 2016 also resulted in a calf from our pasture bull, but this time it was a Fullblood Wagyu that resulted in an F2 bull calf. Notes: This heifer is another in the Greek goddess series. Demeter was the goddess of the harvest, and we hope her namesake is fruitful on our farm. 2016 started off pretty well with a calf by our Fullblood backup bull. Notes: This heifer is one we retained from the 2013 crop as part of the Disney series heifers. 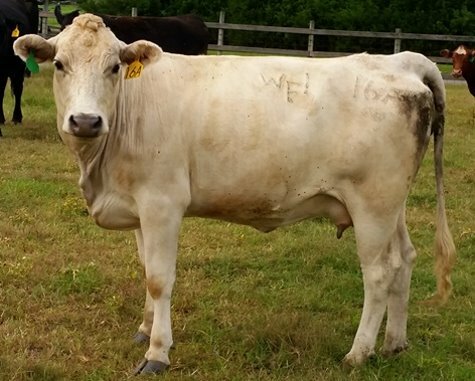 She is also one of our F1 WagyuX cows with a white coat. She delivered a nice heifer calf in the fall of 2015 but we lost it before weaning to an undetermined cause. 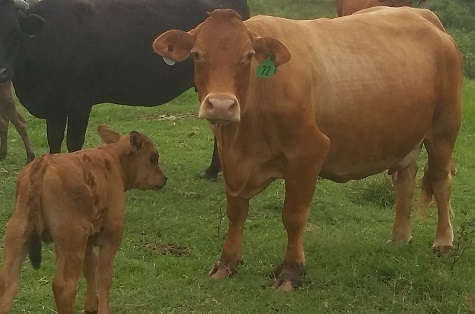 For 2016, she was bred to a Red Wagyu bull and the resulting calf is a pretty tan color (in photo, hidden in wash). Notes: This heifer is one of the three fullblood Wagyu females that we acquired from Lone Mountain Wagyu's sale in 2014. Of the three, she is our favorite and has been the most productive. She came to our farm as a yearling and we bred her to deliver a calf at age two. She delivered a pretty little heifer on 3/14 (Pi Day!) that my daughters named appropriately. Even better, three months after having her first calf, we gave her a try as an embryo donor cow and she did a splended job by delivering 15 viable embryos! This was great news indeed. We timed her second flush with our October breeding and used a top Wagyu bull (Kalanga Red Star) as the sire. The four embryos we flushed were direct transfered into cows for July 2016 delivery and resulted in 3 calves. Her third flush, to another promising young bull (JR-Hiroto), yielded 11 viable embryos. At this point we gave her a break from flushing and AI'ed her to a promising Red bull and got a beauty of a heifer calf in late 2016. 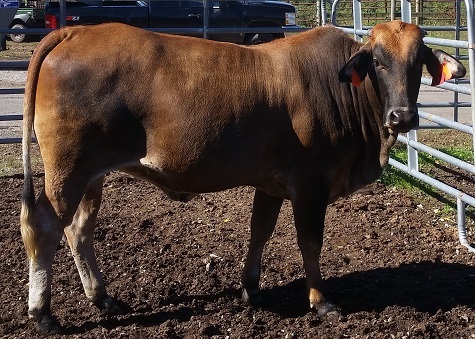 For the February 2017 breeding group, Kenichi proved to be a stellar doner cow and produced 9 fresh embryos for transfer. She flushed 15 embryos in April as well. Embryo transfer has a way of maximizing impact - as a 4 year old, she has 8 calves running around our farm! Notes: This dam joined our team in September 2012 with a calf at her side when we were looking to expand our breeding seasons. We tried her in November but she checked open so we bred her again with the January group and she delivered her first WagyuX calf in October of 2013. 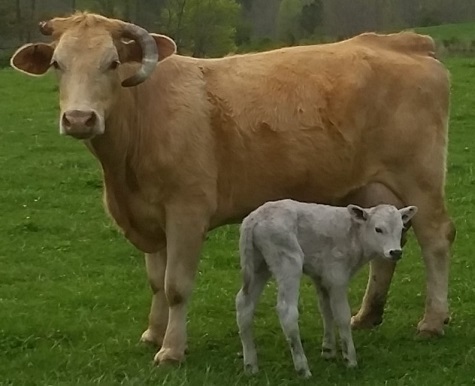 Her 2014 calf was another white faced WagyuX steer. Neither of her F1 efforts graded out well, so we went with an embryo for 2016. 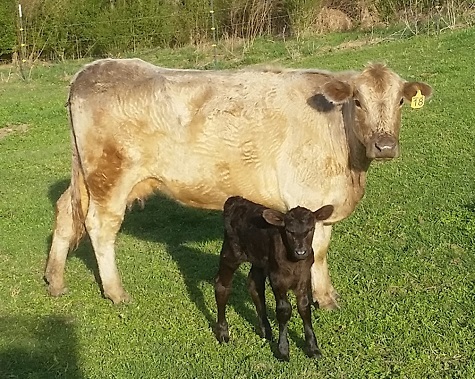 She delivered a second bull for the 56T mating we are excited about, but prolapsed in the process and will be headed out of the program after raising this calf. Notes: This promising young dam joined our herd in the fall of 2012 and quickly became a kid favorite as a friendly cow. 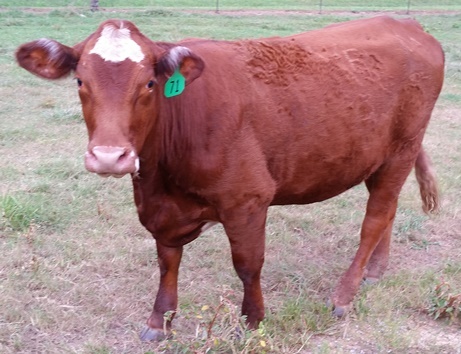 She bore her first WagyuX calf in August of 2013. It graded out well and we retained the heifer for breeding stock. Her 2014 heifer turned out just good and was retained as well - both of these daughters are now producing offspring of their own. 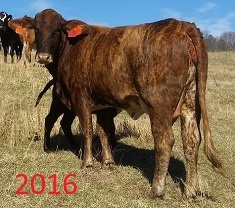 In 2015 however, she missed her WagyuX breeding and delivered us a commercial bull calf. We tried her as a recip for 2016 and she gave us a beauty of a bull calf out of a very promising pairing featureing the 56T bull that we are really excited about. Notes: This heifer is one we retained from the 2013 crop as part of the Disney series heifers. She delivered a nice bull calf in the fall of 2015 that continued the strong performance of her dam and graded out well. 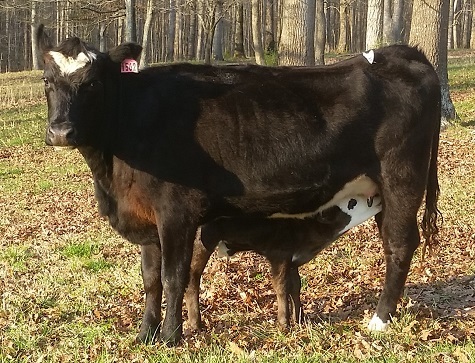 For 2016, she gave a beautiful heifer as part of our Black/Red/Black rotation. Notes: This cow is the first F2 heifer we ever retained as breeding stock. 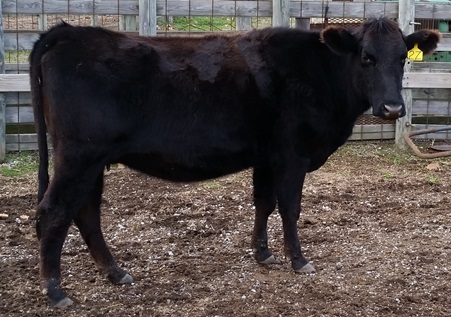 She got off to a rocky start with a stillborn calf in 2014, but has done much better since. Her 2015 calf is a great looking F3 heifer (and will be our first F3 ever retained!). For 2016, we bred her to a Red Wagyu bull and are very pleased with the results. Notes: This dam joined our team in October 2012 when we were looking to expand to multiple breeding seasons. She had her first WagyuX calf in August of 2013. I have been really interested in crossing the Wagyu breed with the Charolais since they are known for size and bone structure. In the case of her 2013 calf, it was disappointing and we did not retain it. Her 2014 calf graded out a little better and was retained. We tried her with an embryo for 2015 but she delivered via our backup bull. We gave the embryo route another try for 2016 and it paid off. Unfortunately, she has developed a chronic hoof issue and will move out of the program after raising this calf. As a base cow in our herd, she has an entry in the AWA database. Notes: This cow joined our farm in 2013 during an expansion. We've always had success with big-boned, large-framed brangus cows, so we are excited about this one. She delivered her first WagyuX calf in 2014, but missed in 2015 (though we are evaluating that heifer for retention as breeding stock). For 2016, as we began to get a lot of embryos to work with, we tried her as a recip and she paid off with another bull calf fom this mating. Notes: This mature cow joined our farm in 2013 when we were looking to expand our numbers. We liked her size and milk potential. 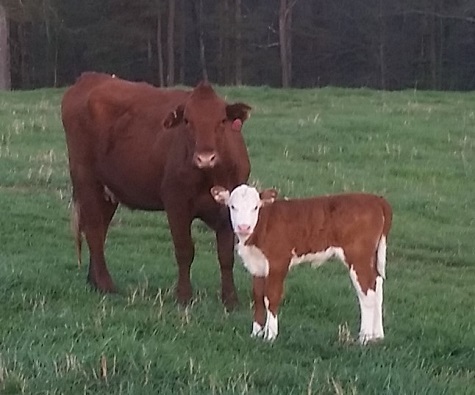 She gave us a nice heifer calf that we retained for breeding stock in 2014, but missed her AI breeding and delivered a heifer from our Hereford backup bull in 2015. (This calf is also being evaluated for retention.) For 2016, we gave her a try as an embryo recip and she delivered a good looking fullblood bull calf with an interesting pedigree. As a base cow in our herd, she has an entry in the AWA database. Notes: This heifer was born on our farm in the 2014 crop of WagyuX calves that got named in a Greek mythology theme. Rhea was a Titan and the goddess of fertility and motherhood. We hope our WagyuX Rhea bears the same qualities, and she is off to a good start with her 2016 calf of Red influence. It came right on time, and looks great! 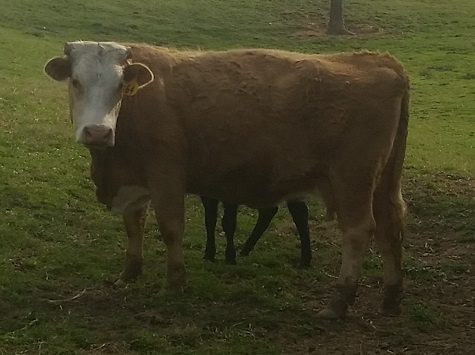 Notes: Yes, this heifer had her first calf at 20 months of age, much to our surprise. We managed to not quite steer one of the other calves in the weaning/growing pasture and when it came time to set up the 2015 calves for breeding, we found her 4 months bred. Luckily, she did fine, and is raising this little calf like a pro. Another Greek goddess heifer, Hecate was the goddess of magic - and she pulled some off with the early pregnancy and delivery! Notes: This great looking commercial heifer from our 2014 season was retained as breeding stock and we are liking the decision as she delivers her first WagyuX calf right on time. Notes: This heifer was born on our farm in the 2014 crop of WagyuX calves that got named in a Greek mythology theme. Selene was the goddess of the moon, which is appropriate for a white WagyuX. Her 2016 calf alternated to Red influence, came right on time, and looks great! Notes: This heifer was born on our farm in the first crop of WagyuX calves in 2011. Technically, she is 49.8% Wagyu due to her Pure Bred sire (hence her RE registration number). After a bit of reproductive trouble early, she gave us an F2 Wagyu heifer calf in August of 2013 that didn't grade out strong enough to retain for breeding stock. Her 2014 effort, another heifer, was better and was retained. 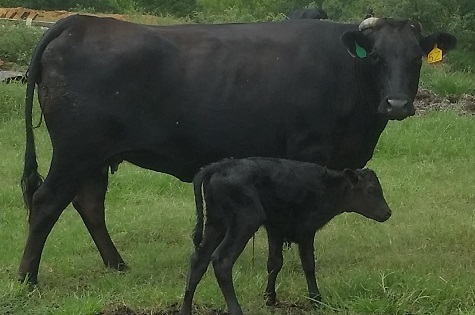 In 2015, she missed her Wagyu AI and delivered a 25% WagyuX bull calf. Notes: This heifer was born on our farm in the 2013 crop of WagyuX calves. I believe she is the last of the 'Disney Princess' series of heifers. She miscarried on her first calf and was rebred to deliver in 2016. This calf was one of the first to arrive after we made a strategic move to start crossing in Red Wagyu genetics. Notes: After good results with our Charolais cattle experimentation, we have continued to sporadically add these dams to the herd. 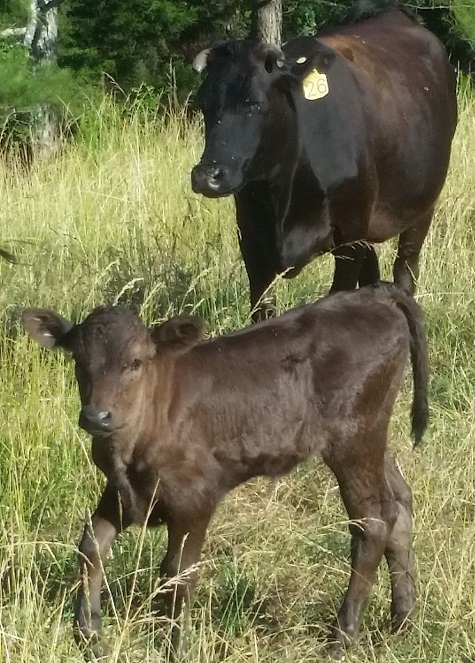 This cow's first F1 calf is off our Wagyu pasture bulls. Notes: This heifer was one of the non-Wagyu calves we retained from our 2012 calf crop. My son named her "Crimson Hide" because she started off red! Now, her nickname is "The Mountain" due to her huge size. 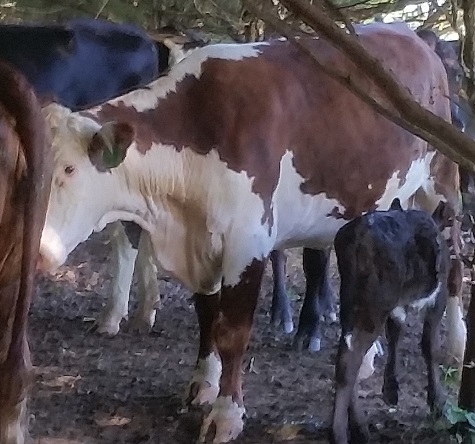 Her dam was one of the tallest Hereford cows we had ever seen and she came to the farm pregnant with this heifer. This young lady has grown into a mountain of a cow and her first calf was literally the largest WagyuX calf we had ever seen. He weighed in at 90lbs at birth! In 2016, she delivered another good looking bull calf to our in-pasture Wagyu bulls. One of these days, she will give us a heifer calf that we can retain! Notes: While in a lull between WagyuX calving period, I am breaking tradition again with info on a non-Wagyu calf. This cow joined us in 2016 with a set of 14 bred heifers, each sporting at least 25% Holstein genetics. 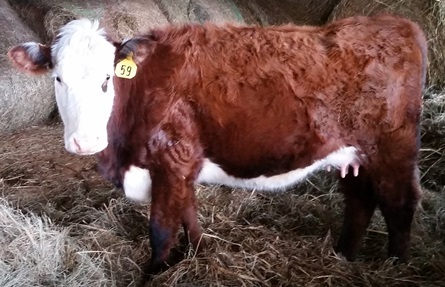 All were bred to a low-birth weight Hereford bull so they should produce some interesting calves. This one sure has the Holstein look and just look at that milk! This one got re-tagged into our breeding groups before her photo. We are very excited about this group and we expect them to do a great job in the future raising our fullblood calves from embryos. Notes: This cow was born on our farm in the second crop of WagyuX calves in 2012. She got her name from hanging out at the salt block when my girls were watching. We bred her in 2013 at 13 months of age, two months before the mature dams in this group to give her a little extra recovery time with her first calf. She gave us our last Wagyu cross calf of 2013 on Christmas day. It was a sad day in 2015 when her second calf arrived and died shortly after birth despite our attempts to nurse it along. She bounced back in 2016 and gave us a late August calf from our in-pasture bull. Notes: This heifer is one of our heifers retained from the 2013 crop as part of the Disney series heifers. Her dam was on of our large framed Brangus cows that give us such good looking F1s. She missed her first attempt at AI breding but caught the second time and delivered a nice bull calf in the summer of 2015. The summer of 2016 brought another F2 bull calf born to our in-pasture 8B bull right on time. Notes: This big girl was one of our commercial heifers born in 2013 that we retained for breeding stock. Her dam was one of the biggest cows we have ever had on our farm. This cow has gave us a good heifer calf that we retained in her first effort. 2016 brought another good looking F1 heifer calf off our 8B pasture bull. Notes: This heifer was born on our farm in the second crop of WagyuX calves in 2012. Her dam is one of our favorite cows on the place and we have high hopes for this heifer. She missed on her first two attempts at breeding, but she has settled into this group. Unfortunately her first pregnancy ended in disappointment and she lost her calf in 2014. We gave her another try and she delivered a pretty little F2 heifer calf right on time in 2015 to start her productive career. 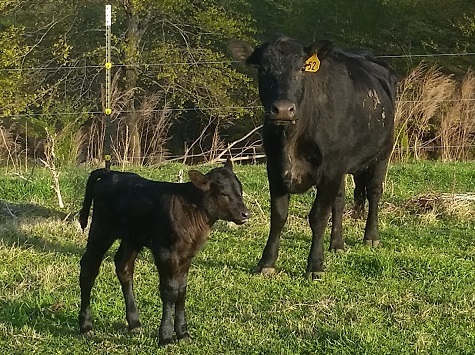 She missed her AI breeding for 2016, but delivered a nice F2 heifer calf from our in-pasture Wagyu bulls. Notes: This gal was one of our commercial heifers in the 2014 crop that we retained for breeding stock. She was bred off the farm and her dam is a conundrum in her own right, but this cow definately has a Texas Longhorn heritage! We've already tipped her horns once and will have to again soon, it appears. She is a great momma and easy to spot in the pasture - a crowd favorite! Notes: This cow was born on our farm in the first crop of WagyuX calves in 2011. Technically, she doesn't count as an F1 since the bull we used the first year was not a Fullblood Wagyu. He was a 99.6% Pureblood, so she doesn't make the 50% cut to be considered a Percentage Cow (hence her RE registration number). We bred her in 2012 at 13 months of age, two months before the mature dams in this group to give her a little extra recovery time with her first calf. She gave us our first F2 Wagyu heifer calf in December of 2012, which was also our last calf of the year. She was bred again with the February calvers and interestingly she delivered the first calf of 2014. Both have evaluated well against our small pool of F2 calves and were retained as breeding stock. She missed her May breeding and slipped out of the February group for 2015 and delivered an F2 bull calf in the June group that also finished in the top of his class. 2016 continued the tradition with a good looking bull calf as she proves her self to be one of our solid performers. Notes: This heifer was born on our farm to one of our F1 WagyuX cows, but her sire was our old Hereford backup bull. That means she is only 25% Wagyu. Any steers less than 50% go straight to the commercial sale, but as a heifer, we evaluated her as a replacement cow and decided to keep her. She gets 'no respect' from the AWA and even though she is in the herd book, the entry says "unregistered". That's okay with her and her calves will have a leg up as a 62.5% WagyuX instead of the normal F1. Her first effort, the little heifer pictured is a great start. Notes: This heifer was born on our farm in the second crop of WagyuX calves in 2012. She is a promising young heifer with a distinctive tiger stripe pattern that makes her easy to identify and a kid favorite. We bred her in 2013 at 13 months of age, two months before the mature dams in this group to give her a little extra recovery time with her first calf. Unfortunately she missed her May breeding and slipped into a later calving group where she delivered a great looking bull calf that graded out in our top 10% in August. A year later, she was back again, with another little bull calf that looks to be just as good. Notes: This cow joined the farm in 2015 as a bred 2nd calf heifer. Along the way, she slipped that calf and was re-bred by our Wagyu bull. Hopefully, she is now back on track and will work in our embryo program. 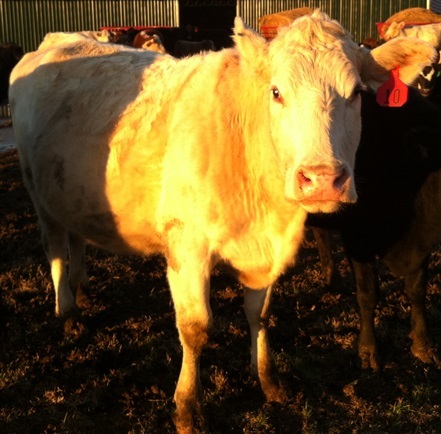 Notes: This cow joined us in 2014 with a little set of Charolais cattle we experimented with to try and introduce a little more frame size and bone structure into our F1s. She only recently showed us what she could do with a WagyuX calf, but as a young cow, will get several more chances. Her 2016 heifer (pictured) has an odd coloration for a WagyuX, but we've come to expect that from the Charolais crosses. Notes: This cow joined the farm in 2013 during an expansion but has not produced a Wagyu influenced calf until now. Her 2016 effort is from our backup bull via natural service, so it looks like she will never be a good ET/AI candidate and may shift out of the program. Notes: This cow was one of the commercial heifers we saved as a replacement cow. She's half Hereford and then a mix of other breeds, primarily red (but notice the brindle pattern expressed). Crossbred cows like this have traditionally performed very well for us and we expect no less from her. We started her off with AI breeding to the 4P pull, who gets a low-birth weight calf for calving ease. She will primarily get Fullblood embryos as she matures. Notes: This cow came in with a group of Herefords in 2012. For the first few years, she never gave us an F1 cross but always delivered a calf from our backup bull. In 2014, we tried her with an embryo and she delivered a Fullblood Wagyu another heifer with a great lineage: World K's Haruki 2 (FB1614) x LMR Ms Kitaguni 8168U (FB8968). We can't wait to see how these calves turn out! Her 2016 effort reverted back to calves from the backup bull, but this time, that bull was Wagyu(!) so we got a little red white faced F1 heifer. This cow has developed issues with milking however, and this will be her last calf in the program. Notes: This dam has been a on our farm since before we kept individual records. 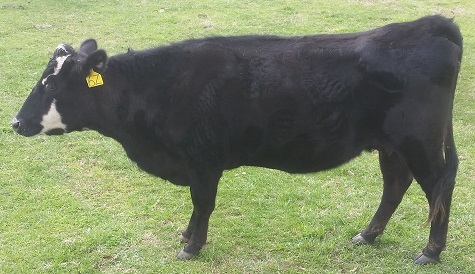 She was part of our first year breeding program and produced a Wagyu F1 bull calf in 2011 and then again in 2012. 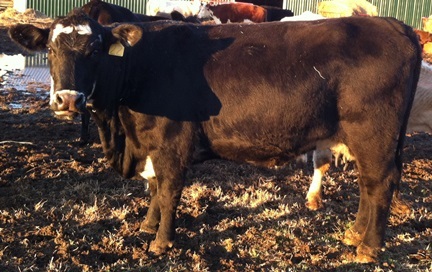 Her calves have great size and growth potential and she is a great milker for her breed. In 2013 and 2014, she delivered heifer calves from our back up bull that we retained, and have turned into great cows on their own right. We kept her away from the backup bull in 2014 and when we found she missed her May breeding, repeated it later in the year. That slipped her into a later breeding group (and gave her a change of ear tag) but gave us the WagyuX calf we were looking for in 2015. She stayed on track for her 2016 effort and delivered another great looking bull calf (pictured). Notes: This cow is one of the commercial heifers we retained from the 2014 calf crop to develop as breeding stock. If her heifer effort in 2016 is any indication, she will be a strong producer for years to come. 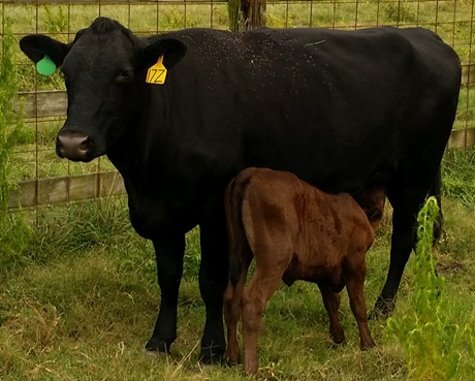 Her calf had the distiction of being the 47th Wagyu influence calf born in 2016, breaking the prior record of Wagyu calves born in any calendar year on the farm (and its only July!). 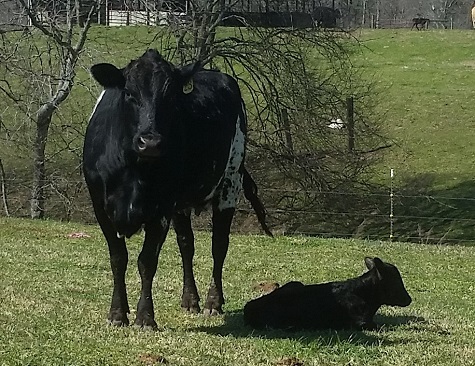 Notes: This cow joined our herd during the 2014 expansion, but missed her first Wagyu AI attempt and delivered a nice heifer from our Hereford backup bull that we decided to keep as breeding stock. We implanted her with an embryo on the next go-around and she produced a Fullblood Wagyu bull - at least we hope. This one has a little different look to him and we remain suspicious until his DNA validation of parentage (necessary for registration) comes back. Notes: We added this large framed cow to the program in our never ending attempts to bring in more bone structure to our Wagyu genetics. Her first F1 was a little disappointing in terms of breeding stock so we decided to implant her with an embryo in 2014. She delivered a Fullblood Wagyu heifer with a great lineage: World K's Haruki 2 (FB1614) x LMR Ms Kitaguni 8168U (FB8968). We are very excited about this new heifer calf! After such a good job with the first embryo, we transferred another one from the same flush and she didn't disappoint. 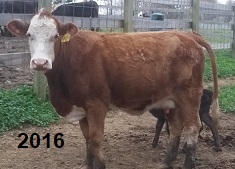 Her 2016 fullblood bull calf is pictured. Notes: This heifer was one of the non-Wagyu calves we retained from our good Hereford back-up bull and one of our favorite momma cows. She looks to have the same great qualities, but got off to a rough start as her first calf died shortly after birth. Her 2016 effort is fairing much better and we expect great results from her for years to come. Notes: This cow is a recent addition to the farm and we started her off with a Fullblood embryo. She gave us our second Fullblood Wagyu bull calf (shown in this picture) with a storied pedigree: World K's Haruki 2 (FB1614) x LMR Ms Kitaguni 8168U (FB8968). For her next effort, she showed she has great potential as a recip cow with another interesting embryo. This one is the famous Kalanga Red Star (red Wagyu) bull over our own Ms Kenichi. We are very excited about these composite red/black Wagyu crosses. 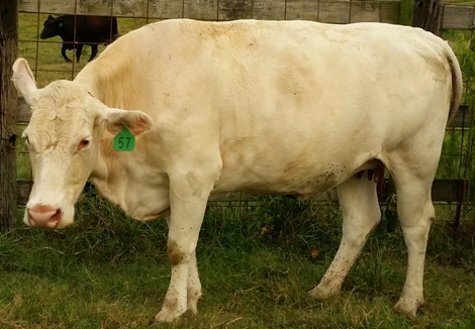 Notes: This cow was a timely purchase in 2014 around the time we came into a supply of embryos. She hasn't had the chance to contribute any F1 progeny, but she has delivered our third Fullblood Wagyu heifer with a big name pedigree: World K's Haruki 2 (FB1614) x LMR Ms Kitaguni 8168U (FB8968). Rolling right along in 2016, she produced another embryo calf - one of our first red/black composite Fullblood Heifers. We can't wait to see how these crosses work for us! Notes: This heifer, retained from our 2012, is from one of our most prolific cows. She took a while to breed and ended up producing a 25% Wagyu calf from our back up bull in 2014 that we sold commercially. She bred right back and delivered a pretty little heifer in 2015. Then things took a turn for the worse and we lost the calf 9 days later. 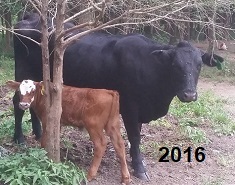 2015 was a tough summer for our little calves. She is back on track in 2016 with a good looking F2 steer calf. Notes: This promising cow is one of the 2014 commercial heifers that we retained for breeding. She missed her first AI breeding but got on track and caught her second to deliver her first calf in the summer of 2016. Notes: This good looking cow was born on our farm in 2011 at the same time as our first crop of Wagyu cross heifers. We liked her look (as well as her dam's) so much we kept her as a replacement cow and our daughters gave her a name with the rest of the retained heifers. It turned out to be one of the best decisions we've ever made as she has produced some great F1 calves. 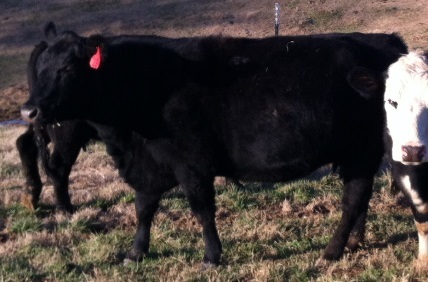 She was bred with the February group and gave us an F1 Wagyu heifer calf in February of 2013. Even as a heifer, her calf placed in our top ranks on evaluation. 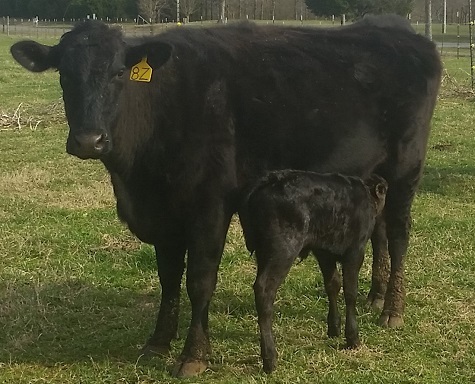 Her calf in 2014 is also placing in our top group and we made sure she took her Wagyu breeding even though she slipped into a later group and delivered an F1 bull calf in June. 2016 brought another calf right on schedule as this cow continues to turn out some of our best looking F1 calves on the farm. She is one high quality cow! 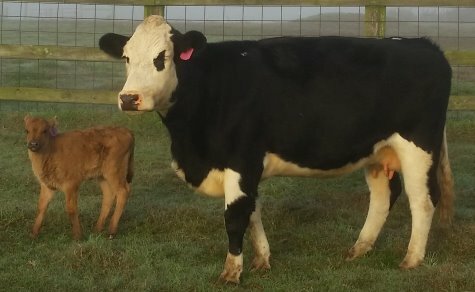 Notes: This cow was purchased to help expand our calving seasons in 2012, but it was a while until she had her first Wagyu cross calf. 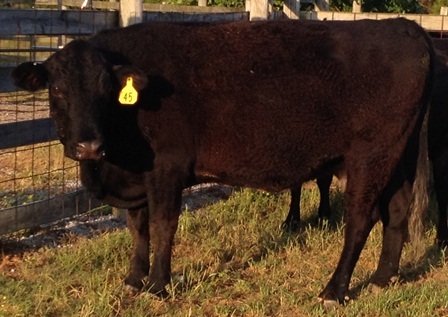 By 2014, we had a stock of full blood Wagyu embryos looking for good recips and she proved to be a good candidate. Her 2015 calf was the first Full Blood Wagyu heifer born from an embryo on our farm and issued in a whole new phase of our operation. 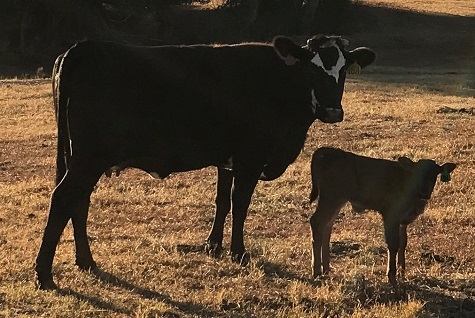 She followed up that effort in 2016 with a second embryo calf, a bull this time. Notes: This lady was the first calf of one of our favorite cows on the farm (Ms Sweetie), and is one of the most promising F1 heifers we've produced. She was bred at 15 months and delivered a calf in the February group in 2015 during one of the coldest spells we've had in a long time. She and three sisters were moved into a hastily created 'maternity ward' in our hay barn where she is pictured with her calf. In the early days, she is showing great promise as a prolific milker like her mother! For her second effort, it took two tries to get her bred so she slipped back into the July calving group and delivered a second F2 heifer. We hope her offspring continue her strong maternal characteristics. Notes: This heifer is one of the three fullblood Wagyu females that we acquired from Lone Mountain Wagyu's sale in 2014. She came to our farm as a bred heifer, safe in calf to a Wagyu foundation bull, Shigeshigetani (FB2907). The resulting calf was a FB bull that we evaluated and selected to retain as a future herd sire for our own use. After calving, we gave her a try as a donor cow in our embryo production program, even though we were suspicious that her temperament was not suited to flushing. Her first flush attempt was a flop, but showed enough potential that we decided to try again. After a second poor performance, we dropped her from the donor group and turned her out with our FB bull. Nine months later, we were happy to see a good looking heifer calf at her side. Notes: This dam has been with us since before we kept records on individual cows. She isn't the biggest cow we own, but she is easy to identify in the pasture and you can't argue with her success. Her first two WagyuX heifers had solid white faces but in 2013, she broke that streak with a pure black heifer. 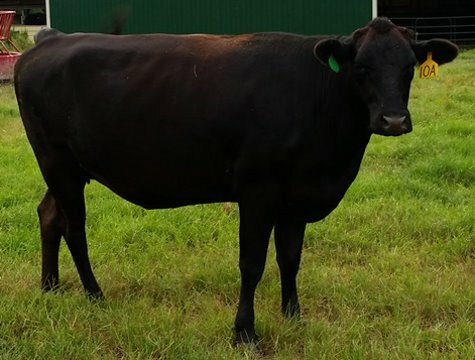 Her calves generally run small so she was chose as a recipient cow for a Full Blood embryo in the Spring of 2013 and delivered our first ever Fullblood Wagyu calf in February 2014. As such a prolific cow and because she was in such great shape, we implanted another embryo for 2015 and she didn't disappoint as she delivered another full blooded Wagyu bull (a full brother to 8B) right on time. Her impressive streak of 5 consecutive successful AI/ET sessions came to an end in 2016 as she delivered a little mott faced bull calf from our FB Wagyu backup bull. Because of her status as a base cow in our herd, she has an entry in the AWA Herd book. Notes: This cow has been on our farm since 2012, but has always calved to our backup bull. 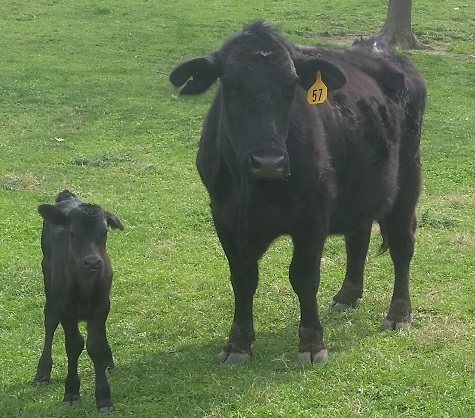 The same held true in 2016, but in this case our backup was a Wagyu bull, so we finally get an F1 WagyuX calf. 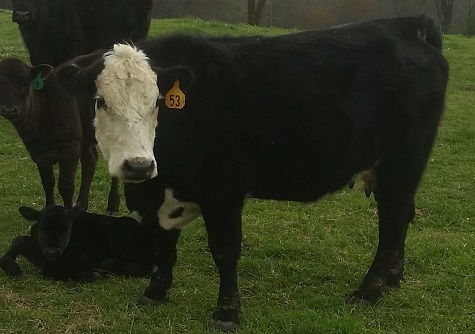 She has a little something other than Angus in her blood (notice the white markings around her nose) and she pased on just a little of that white marking to her calf who also has a white ring around her nose. Notes: This heifer is one of our F2 retained heifers and represents another step on the path to our own home grown Purebreds. As an F2, her offspring will be 7/8 Wagyu and only a step away from that classification. She delivered a little F3 heifer on her first try with no issues whatsoever. Notes: Breaking protocol again and picturing a non-Wagyu calf. This cow joined us in 2016 with a set of 14 bred heifers, each sporting at least 25% Holstein genetics. All were bred to a low-birth weight Hereford bull so they should produce some interesting calves. This one doesn't carry much of the Holstein look, but she sure has great milk. We are very excited about this group and we expect them to do a great job in the future raising our fullblood calves from embryos. Notes: This dam has been on our farm since before we kept records on individual cows and has been a consistent performer for us in our Wagyu cross program. 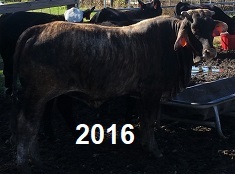 She has delivered a Wagyu F1 cross bull calf in 2011, 2012, and 2013. Her calves aren't the largest in frame size but she is a good milker and raises strong healthy calves. 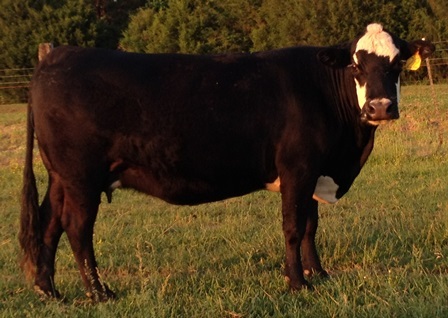 Given this pattern, she was chosen as a recipient cow for one of our Full Blood embryos in the Spring of 2013. 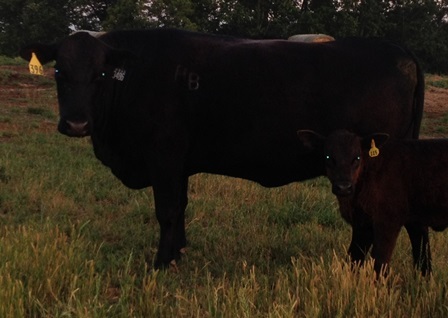 In February of 2014, she successfully delivered our second Full Blood Wagyu bull calf of the year! 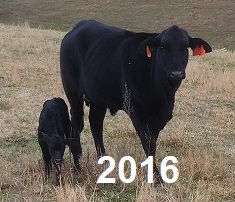 2015 brought a commercial calf and maybe just one more year of the Wagyu program. 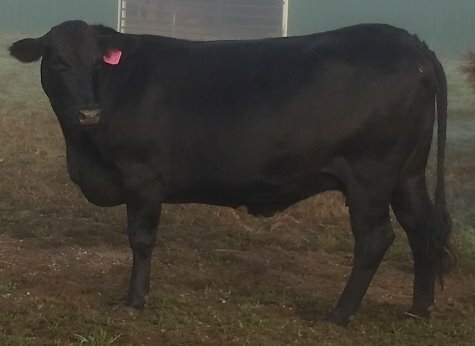 She delivered a final Wagyu cross bull calf in 2016. Notes: Breaking protocol again and picturing a non-Wagyu calf. This cow joined us in 2016 with a set of 14 bred heifers, each supposedly sporting at least 25% Holstein genetics. All were bred to a low-birth weight Hereford bull so they should produce some interesting calves. I have my doubts about the Holstein influence in this one, but she still holds a lot of promise as a solid heifer. We are very excited about this group and we expect them to do a great job in the future raising our fullblood calves from embryos. Notes: This cow is out of our commercial operation and represents a common type found in our area - crossbred with a little bit of everything, good maternal instincts, long-lived and productive. We have a sister that looks just like her (G-63). This cow never would catch on a Wagyu AI, and was on her way off the farm when cull cow prices dropped through the floor. While waiting for the market to come back, she got bred by our FB Wagyu bull. We decided to give her another year to raise this WagyuX calf. Notes: Breaking protocol again and picturing a non-Wagyu calf. This cow joined us in 2016 with a set of 14 bred heifers, each sporting at least 25% Holstein genetics. All were bred to a low-birth weight Hereford bull so they should produce some interesting calves. We are very excited about this group and we expect them to do a great job in the future raising our fullblood calves from embryos. Notes: This dam was actually born on the farm back in our commecial operation days. She is basically a 'pet cow' to our kids and has always raised a good calf. 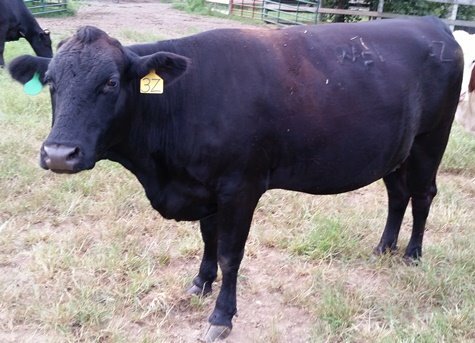 She has participated in the Wagyu program since the begining and only missed her AI pregnancy once. 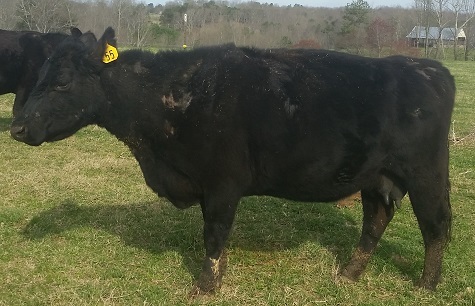 Though her recent efforts have produced steers for beef, we always retain her heifers for cows due to her strong maternal genetics and she has several daughters in production in the program. Because of her status as a base cow in our herd, she has an entry in the AWA Herd book. Notes: This young cow joined our team in 2014 with a group of pairs we bought to replace some of our older stock. She was bred with the May group and delivered her first WagyuX calf right on time in the cold and snow of 2015. Her second WagyuX calf is from one of our backup bulls but looks to be a good one. Notes: This cow joined our program in 2014 with a small commercial calf at her side, just in time for the May breeding season. She delivered her first WagyuX calf in our program in February of 2015. Though she missed her shot at an embryo for 2016, she delivered a nice F1 calf to our fullblood bull in the exact same location we photographed her with her 2015 calf. Notes: This heifer was born on our farm in the second crop of WagyuX calves in 2012. She got her name from her distinctive white face markings that make her easy to pick out. We bred her in 2013 at 13 months of age, two months before the mature dams in this group to give her a little extra recovery time with her first calf. She was bred again with the February calving group and gave us her second calf right on time. Calf number three is a cute mott faced black bull that continues her consistent performance. Notes: This dam joined our herd with a set of like heifers (all sporting an HB brand) in March 2012 with a calf at her side as a new entry into our Wagyu program. 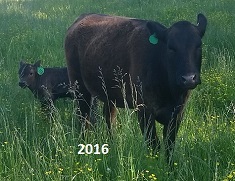 She had her first Wagyu F1 calf in 2013 and followed it up with another in 2014. Her second effort graded out well and we retained the heifer for breeding stock. This cow does work well with AI breeding and she did not dissapoint as she delivered an early WagyuX calf in February of 2015. We decided to try her with a full blood embryo for 2016 but that failed and she delivered a calf (with a floppy ear!) to our fullblood backup bull. Notes: This dam has been on our farm for a number of years. 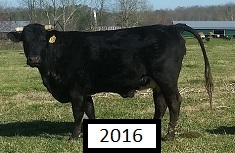 She had a Wagyu cross steer in 2012 that started out a little small but grew very well by the time he reached maturity. Her 2013 calf was an F1 Wagyu cross heifer that graded out well and we retained as a stock cow. In 2014, she kept the streak going with an F1 Wagyu bull calf that also landed in our top tiers of grading. 2015 was a disappointment as we ended up with a commercial calf but she bounced right back in 2016 with a good looking bull calf. Even though she is getting a little older, she'll be with us for a while. Because of her status as a base cow in our herd, she has an entry in the AWA Herd book. Notes: This heifer was born on our farm in the second crop of WagyuX calves in 2012 and is one of the 'Disney Princess' series of heifers. She was bred with the May group and calved right on time in 2014 with a F2 bull calf that graded well agains his peers. She stayed in cycle with the May group and delivered a little heifer in the cold and snow of 2015. In 2016, she once again stayed right on schedule and actually had her third calf on the exact same birthday as her 2015 baby. Notes: This young cow came in during one of our upgrade expansions. 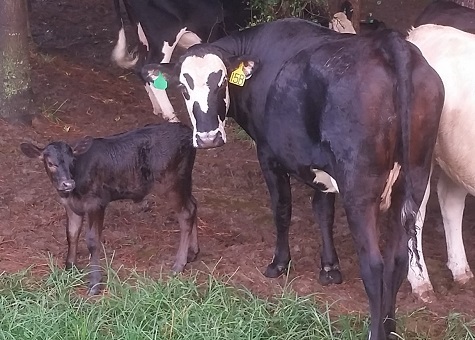 She missed her first AI try but delivered a Fullblood bull calf in 2016. Notes: This heifer was born on our farm in the second crop of WagyuX calves in 2012. She didn't catch on the first try but did when the May group was bred and delivered her first calf in February of 2014. While her first calf was a little small, it made the cut to be retained for breeding stock. Her second and third calves came right on schedule and we are very pleased with her performance so far. It is not often a heifer comes in so consistently - now only if her offspring graded out a little better. Notes: This big crossbred cow is a recent addition to the herd and should have a bright future with us. She is an excellent mother and her 2015 calf she was carrying at purchase is likely to be retained for breeding stock as well. Notes: This dam joined our team in 2015 after we had some good success with Wagyu over Charolais crosses. 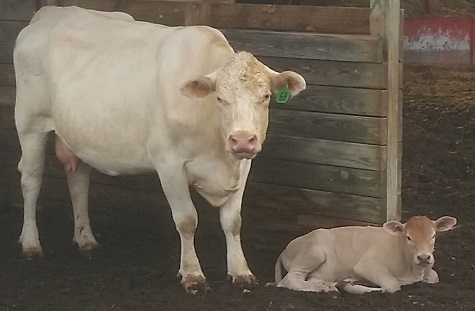 Her 2015 calf was a beautiful white heifer we intend to retain and in 2016, she delivered a white F1 WagyuX heifer, her first calf that was bred in our program. Breed: Commercial ??? not sure ??? Notes: This interesting looking cow is not hard to find in our pastures. Not sure her breed but maybe longhorn (? ); the calf she was carrying when we bought her certainly had huge horns, but Y-23 would be the fattest longhorn I've seen (and was obviously dehorned very young or cosmetically maybe). Anyway she's a great mother, though she lost a calf in the ice storms of February 2015. We hoped she would raise an embryo calf for us in 2016, but she missed and ended up with a calf from our big fullblood bull, Noche. Notes: This dam joined our team in October 2012 when we were looking to expand our breeding seasons and found a nice group of Charolais cattle to experiment with. 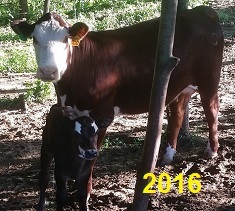 She had her first WagyuX calf in August of 2013 but missed for the next couple of years (including a set of twins in 2015). 2016 got her back on track with another WagyuX calf. We like the way this breed cross works and may add more Charolais stock in the future. Notes: I am breaking protocol here and listing a cow that has not yet had a Wagyu influenced calf. This beauty of a cow came with a set of 9 bred Brahaman influenced sisters I bought in 2015 to expand the herd and introduce a new genetic influence to try. These hand-raised, puppy dog friendly girls had the same gray Brahman bull sire even though they each have their own distinct look. They were bred to a low birthweight Angus bull for easy calving and delivered exactly as promised. I hope these girls contribute to our program for many years. Notes: This dam has been with us for many years and is pictured with her 2012 calf. She had WagyuX heifers in 2011 & 2012 but missed in 2013, 2014, & 2015 and produced HerefordX calves we sold at market. Somewhere along the line she lost her 42 tag and ended up as Yellow-55. We tried her with a full blood embryo for 2016 and she came through with a heifer calf. It was born early, weighed only 34 lbs at birth, and required special treatement for the first week of its life with heat lamps at night and bottles. It's good to have this cow back on track! Because of her status as a base cow in our herd, she has an entry in the AWA Herd book. 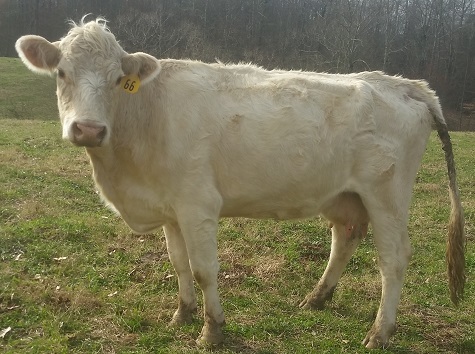 Notes: This heifer was retained for breeding purposes from the calf crop of 2013 and her white coat got her a Disney name from the Frozen movie. She bred right away but suffered a set back in the summer of 2015 as her first calf died shortly after birth. We think she will snap right back and contribute for years to come. Notes: This heifer was born on our farm in the second crop of WagyuX calves in 2012. Her first calf, born late in 2013 died shortly after birth but she followed with a good bull calf for her second effort in August. Notes: This big cow joined our farm in time to contribute to the 2014 WagyuX calf crop with a very good heifer. She came through right on time in 2015 with another great looking F1 heifer calf that crossed the scales with a whopping 90lb birth weight. Notes: This dam came to our farm in the fall of 2010 with a calf by her side. 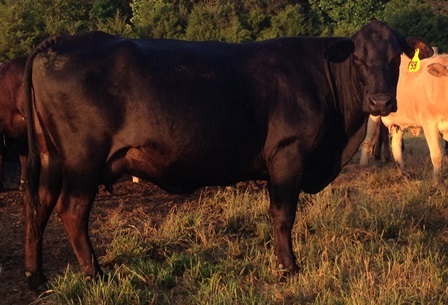 She entered our Wagyu program and bore a large Wagyu F1 steer in 2012. She missed on the May 2012 breeding and slipped into Fall group (hence the change to a red ear tag) and gave us another bull calf in August. After a couple of AI misses that yielded commercial calves (one which we plan to retain as breeding stock). Due to her age, she will be out of our program after raising this one. These cows were part of our Wagyu program at one time but are not any more. They are listed here to provide information on the lineage of cattle still in the program. Notes: This dam joined our herd with a set of like heifers (all sporting an HB brand) in March 2012 with a calf at her side as a new entry into our Wagyu program. She missed her first couple of tries at AI breeding and then finally caught in November, yielding an August calf. For 2014, she delivered one of two sets of twins we had born during that calendar year. This cow has always been hot headed and hard to handle. After a 2015 commercial calf (that we are actually evaluating retaining) we sold her out of the program based on her attitude alone. Notes: This dam has been with us for many years. 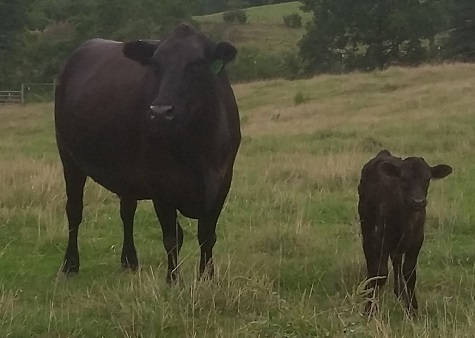 She produced an Wagyu F1 bull calf in 2012 that started out a little small but grew well. She missed on the May 2012 breeding and slipped into the Fall group, got a new color ear tag and delivered another WagyuX bull calf in October of 2013. This custom beef making machine delivered another steer for the feeding program in 2014. This one knocked a home run and ranked in the top 20% of F1 steers we've produced. 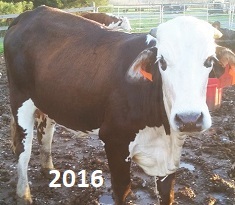 After missing in 2015 and again in 2016, we sent had to give up on this cow due to her age and shifted her out of the program. Notes: This cow got a new lease on life starting in 2014 with her first WagyuX calf. She is 'high strung' and hard to work with and was on her way to a life on another farm when she turned up AI bred. Not wanting to pass on her temperament, we tried implanting an embryo in 2015 and she came through with a heifer calf we are very excited about. 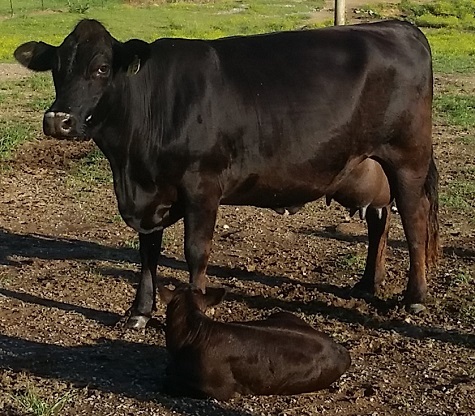 This calf (shown in the photo) is the product of a Red over Black Wagyu mating - combining great size and structure from Kalanga Red Star (FB 12904) with great black genetics from Akemi (FB 7612). P-9 is a good, but frustrating mother. She kept this little heifer hidden in the woods for 7 days before we got a good look. After raising this calf, and missing on an embryo, we decided to send her out of the program due to her bad attitude. Notes: This cow is out of our commercial operation and represents a common type found in our area - crossbred with a little bit of everything, good maternal instincts, long-lived and productive. We implanted an embryo in her in 2014 and she delivered a great looking Fullblood Wagyu bull with a great lineage: World K's Haruki 2 (FB1614) x LMR Ms Kitaguni 8168U (FB8968). She failed to deliver a calf in 2016 and we removed her from the program due to her age. Notes: This cow died in calving in 2016. 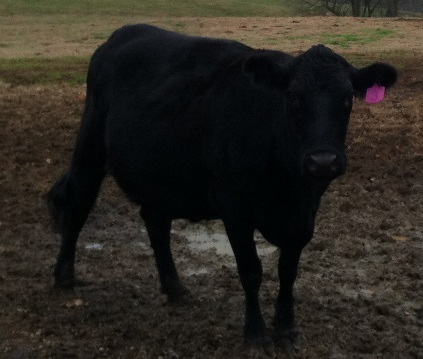 She was one of our heifers from our backup bull that we retained as a replacement cow with our Wagyu crosses. She was bred at 15 months and delivered the first calf in the February group in 2015 during one of the coldest spells we've had in a long time. She spent time in the hastly created 'maternity ward' in our hay barn with her little calf. Notes: This dam has been on the farm since before we kept individual records on cows. 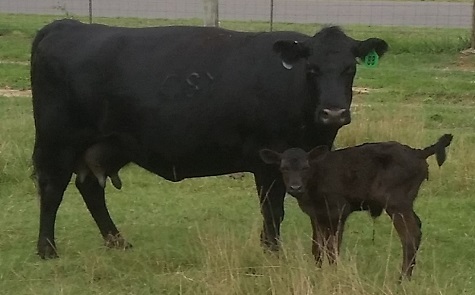 It took a while to get her in the Wagyu program though, and she delivered her first WagyuX calf in August 2013. After several more misses and a continued habit of slipping into later and later groups, we culled this cow. Because of her status as a base cow in our herd, she has an entry in the AWA Herd book. Notes: This dam joined our team in October 2012 when we were looking to expand our breeding seasons. She was one of the cows who we bred in November before settling into a different routine. She had her first WagyuX calf in August of 2013 but will be shifting to October going forward. This large frame cow is in her prime and should have been with us for a while. Unfortunately she developed internal issues and had to be culled from the program. Notes: This dam has been in the Wagyu program since the beginning. In 2011 she produced one member of our first set of Wagyu cross heifers, WF Ms Red 2Y. 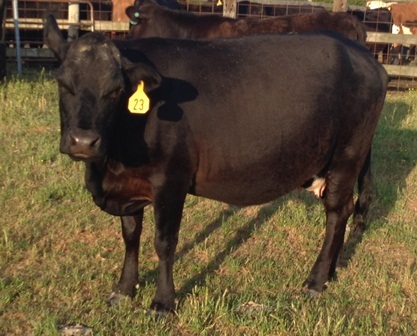 In 2012, she gave us another Wagyu F1 heifer, WF Ms Spritz 3Z. 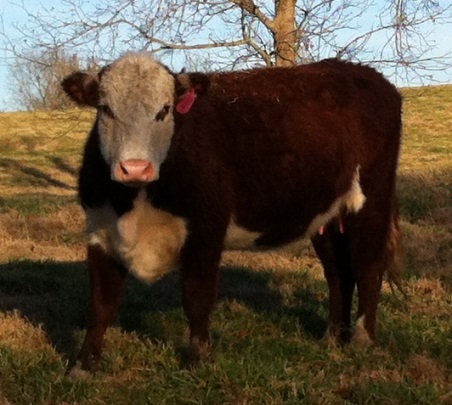 In 2013, she missed her Wagyu breeding and produced a Hereford cross bull from our backup bull that we sold at market. In 2014 and 2015, she also delivered a calves from our back up bull. After yet another missed AI breeding we removed her from the program due to her age. Because of her status as a base cow in our herd, she has an entry in the AWA Herd book. Notes: This mountain of a cow actually came to our farm via our vet. She arrived bred with a WagyuX calf and delivered a big F1 Wagyu bull in August. She was one of the largest cows on our farm and we were curious to see how her calves would measure up to the rest. She had one more calf in the program and then ran into problems re-breeding and issues with her feet and was culled. Notes: This dam joined our team in December 2012 with a big commercial bull calf at her side when we were looking to build the October group. 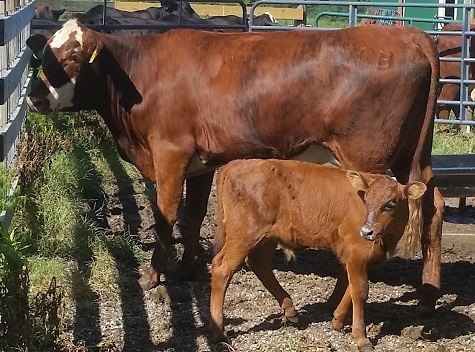 She caught on the first try in January and delivered her first WagyuX calf in October. As a young cow in her own right, we hoped she would be a producer for us for years to come but she injured her shoulder joint and would never recover. Notes: This dam joined our team in October 2012 when we were looking to expand our breeding seasons. We tried her in November but she checked open so we bred her again with the January group and she delivered her first WagyuX calf in October of 2013. The kids are big fans of the Wagyu-Hereford cross since the calves generally have white faces and her calves don't disappoint. She delivered again on schedule in 2014 with a good steer calf, but after that effort she failed to re-breed and was shifted out of the program. Notes: This dam joined our team in August 2012 with a calf at her side when we were looking to expand our breeding seasons and started on a little Hereford buying spree. We tried her in November but she checked open so we bred her again with the January group and she delivered her first WagyuX calf in October of 2013. She is my least favorite of the Herefords just from her looks - and after two substandard calves, we sold her out of the program. 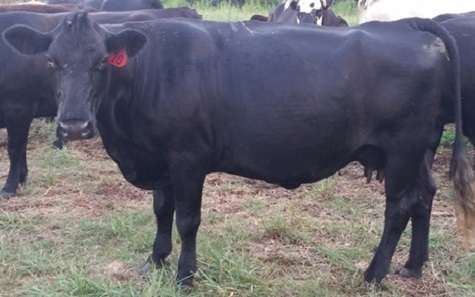 Notes: This dam spent a year in the Wagyu program and in 2012 she produced a Wagyu F1 heifer, WF Ms Precious 2Z. She missed breeding in 2012 and was on her way out of the program due to her age when we decided to make her a recipient for one of our Full Blood embryos in Spring 2013 - she checked safe in calf but turned out bred to the backup bull and was dropped from the program later in the year. Because of her status as a base cow in our herd, she has an entry in the AWA Herd book. Notes: This dam has been in the Wagyu program since the beginning. In 2011 she produced one member of our first set of Wagyu cross heifers, WF Ms Flower 6Y. In 2012, she gave us another Wagyu F1 heifer but in 2013, she missed her Wagyu breeding and produced a Hereford cross calf from our backup bull. Due to her age and the relatively small size of her progeny, we chose to implant her with one of our Full Blood embryos in the Spring of 2013. Unfortunately, she didn't take and we used this excuse to move her out of the program. Because of her status as a base cow in our herd, she has an entry in the AWA Herd book. Notes: This dam joined our herd with a set of like heifers (all sporting an HB brand) in March 2012 with a calf at her side as a new entry into our Wagyu program. She had her first Wagyu F1 calf in 2013 but we were not impressed with her maternal characteristics and she raised the smallest heifer of the group. For 2014, she missed her Wagyu AI breeding and gave us a good exuse to remove her from the program. Notes: This dam joined our herd with a set of like heifers (all sporting an HB brand) in March 2012 with a calf at her side as a new entry into our Wagyu program. 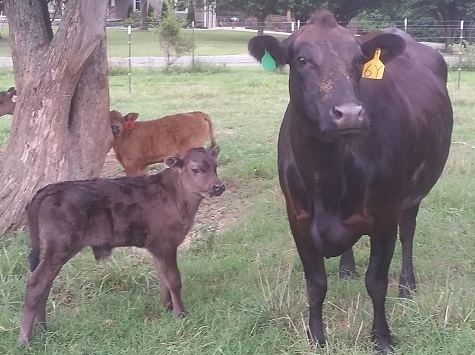 She had her first Wagyu F1 calf in 2013. 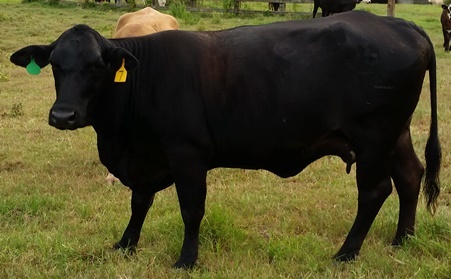 She was sold in 2014 due to temperment issues when it turned out she had missed her Wagyu breeding. Notes: This dam has been with us since before we kept records on individual cows. All her progeny have a bit of character to them. She produced a mott faced heifer in 2012 and another in 2013. She is one of our more nervous cows, and her offspring tend to inherit that undesireable trait, so we chose her as a recipient cow for on of our Full Blood embryos in the spring of 2013, but it didn't take and she had a red mott faced calf from our back up bull that we liked enough to retain. Due to her age, we moved her out of the program. Because of her status as a base cow in our herd, she has an entry in the AWA Herd book. Notes: This dam was with us since before we kept records on individual cows. She was a big, tall, long Brangus cow with lots of milking ability and she gave us several heifers that have her same long frame and great maternal characteristics. She missed her Wagyu breeding in 2014 and we took her out of the program due to her age and condition. Because of her status as a base cow in our herd, she has an entry in the AWA Herd book. Notes: This dam was with us for a long time and was one of the tallest and largest cows on our farm. She really stood out in the crowd and we loved the frame and growth characteristics she passed on to her calves. 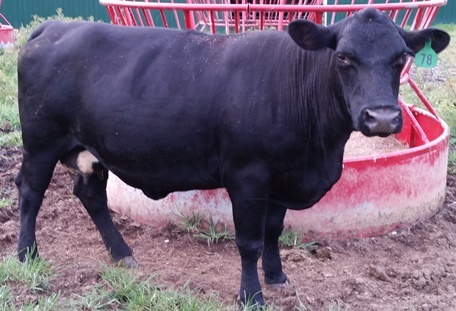 In 2012 she delivered a Wagyu F1 cross bull calf that led his brothers in size and growth. In 2013 she produced a Wagyu F1 heifer calf that we are looking forward to seeing develop into a replacement cow - hopefully one who caries forward her mother's great frame. 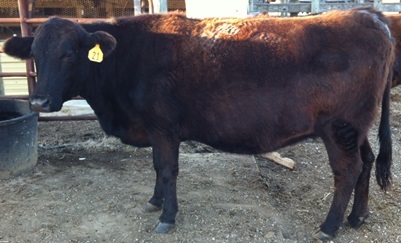 By 2014, her age caught up to her and she missed her Wagyu breeding and fell out of the program. Notes: This dam was one of the oldest producing cows on our farm, but it was hard to argue with the success she had in our Wagyu program. In 2011 she produced one member of our first set of Wagyu cross heifers, WF Ms Belle 3Y. She repeated the feat in 2012 and 2013, giving us our first calves of the year, both F1 Wagyu heifers. 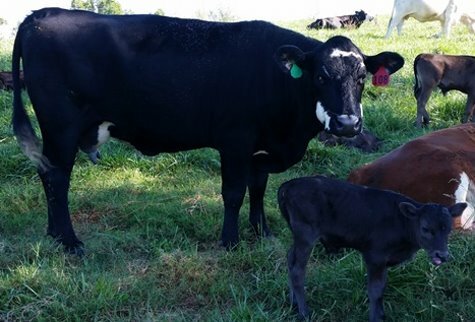 With two progeny as retained heifers, she really contributed to the future of the Whitesell Farms Wagyu herd! Unfortunately in 2013, she missed her breeding and injured a hip and was removed from the program. Because of her status as a base cow in our herd, she has an entry in the AWA Herd book.